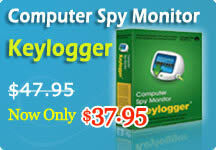 Computer Spy Monitor Keylogger is stealth computer spy software that lets you know EXACTLY what others do on your PC while you are away; an invisible PC Keylogger which allows you to secretly record all activities of PC users including all keystrokes and screenshots captured. Moreover, it supports remote monitoring through logs report delivery via email without any physically need. LAN Employee Monitor – is a stealth monitoring tool for employee performance and employee management. The LAN monitoring software monitors the screens of all employees’ computers in real time by matrix screen (including dual monitors). It allows to record keystroke, log websites visit, websites filter. Log transfer rate and to remote control the employee's PC in a breeze. LAN Employee Monitor is the perfect solution for keeping your employees from being idle. With LAN Employee Monitor, your employees will not continue their endless chats, playing games or surfing the web at work time. It will improve company productivity and make sure the computer internet and information are more secured. Spy Voice Recorder - Computer spy software, an easy sound monitoring and voice recorder software on your computer. This voice recorder is designated mainly to record and spy Voice Chat message of instant messengers, including Skype Voice Chat, Yahoo!Messenger Voice chat, ICQ Voice Chat, Google Talk Voice Chat, etc. It can record other sounds as well, such as streaming audio from Internet, music played by Winamp, the sound from microphone, earphone, etc. Spy Monitor Screen Recorder software, a computer screen recorder and spy monitor software. It allows to secretly capture screen activities and mouse movement on your computer into WMV or AVI files uninterruptedly or schedule your recordings as you fixed; or you can choose to capture specified screen activity which is useful and important to your monitoring target. Spy Monitor Screen recorder is just like a desktop camera. Every desktop and cursor activity, keystroke typing, some window or program opening or closing, website browsing, IM chatting and all other PC activity will be captured and all of these can display incessantly in the video files. This monitoring software was made in hidden when it works. It is an excellent spy software to monitor employees, child, cheating spouse. SMS Recovery - Recover deleted message on iPhone and Android phone. SMS Recovery is mobile phone sms recovery software. It can retrieve deleted sms in all iPhone and Android phone. After deletion of message, the data blocks storing the message are not deleted from the database immediately, but are marked as the unused block. These data blocks can be covered only when new SMS are stored in the database. If you use our software for recovery before the deleted data blocks are covered by the new data, you can successfully recover all the SMS.